The fifth edition of this spectacular event features amazing light, sound and drama. More than 60 costumed participants and 15 horseback riders in Matera’s old town and the sassi neighbourhoods recreate the Processo a Gesù (Procession of Christ) in unforgettable fashion in the week leading up to Easter. 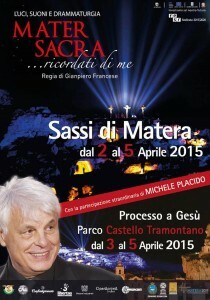 The concept of Mater Sacra is to use the most cutting edge technology (lasers, video and audio) to tell one of the most ancient and moving stories, that of the Passion of the Christ. It is all the more appropriate that Matera is the scene of this blending of ancient and modern as the city itself has epitomised this in its recent astounding renaissance. The event changes over the days to reflect each part of the story at the appropriate time in Holy Week, the culmination being the raising of the three crosses against the dramatic backdrop of the Matera landscape.